Frontiers Records is pleased to announce the release of PRIMAL FEAR new album, Delivering the Black, on January 24th in Europe and January 28th in North America. On the heels of the general consensus met by the previous studio album Unbreakable which was the band’s highest chart entry in Germany at Position #31, charting in 7 other countries, PRIMAL FEAR are only getting better with time and metal fans around the world are acknowledging this. After some very intense songwriting sessions and pre-production schedule, the band started to record the new album, Delivering The Black in summer 2013 at the House of Music studios in Germany, with producer Mat Sinner and engineer Achim Koehler. 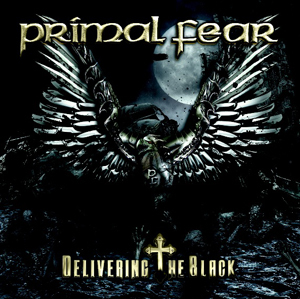 The idea was to create the most powerful PRIMAL FEAR album ever! The band then moved to Denmark in September to finish the album with acclaimed producer/engineer Jacob Hansen (VOLBEAT, PRETTY MAIDS, AMARANTHE) handling the mix. Delivering The Black combines the strongest PRIMAL FEAR moments ever, with a well-balanced typical PRIMAL FEAR trademark riff-vibe, crushing songs and some very ambitious musical journeys. The centerpiece of the album is the two epic tracks, “When Death Comes Knocking”, and the 10 minute opus “One Night In December”, spiced with big orchestral arrangements and complex sound designs. Classic and ultra-fresh PRIMAL FEAR riff-rockers like the title track, the album opener “King For A Day” or the groove monsters “Alive And On Fire” and “Road To Asylum” hit the bulls-eye just like the untamed speed killer “Rebel Faction”. The ballad “Born With A Broken Heart” shows a new side of PRIMAL FEAR with an acoustic guitar vibe and the addition of Liv Kristine (LEAVES’ EYES) on backing vocals. Delivering The Black will be available in regular cd edition, deluxe edition with 2 bonus tracks and – in cooperation with Soulfood Music -vinyl edition and DVD and limited edition (666 copies only!) of a Super-de-luxe version including a metallic eagle! "Born with a Broken Heart"
DVD (Only available with Deluxe edition) – "When Death Comes Knocking" (video), "King For A Day" (video), Making of the Album (video). …… more shows will be added soon! PRIMAL FEAR on tour with Rock Meets Classic feat. Alice Cooper, Uriah Heep & more!